GH3D-389 | Size: 50 ml / 1.69 fl.oz. 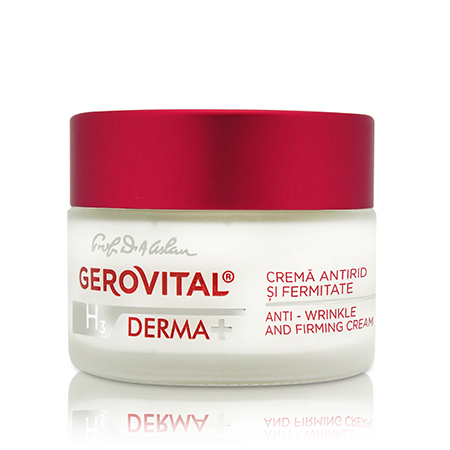 The cream addresses wrinkled complexions, young or mature, lacking firmness. It stimulates extracellular matrix essential protein synthesis, increasing the density of the dermis and its firmness. Its formula offer anti-wrinkle, firming, regenerating and restructuring action, protecting against the destructive action of the free radicals. Hyaluronic Acid - is the core substance forming the extracellular matrix and has the capacity to bind large quantities of water, being directly responsible for the skin moisturizing level. Helps reducing inflammation and has cell-communicating abilities. INGREDIENTS: AQUA, CETEARYL GLUCOSIDE, CETEARYL ALCOHOL, SUCROSE POLYSTEARATE, HYDROGENATED POLYISOBUTENE, SQUALANE, CAPRYLIC CAPRIC TRIGLYCERIDE, GLYCERIN, HYDROXYPROPYL CYCLODEXTRIN, PALMITOYL TRIPEPTIDE-38, DIPALMITOYL HYDROXYPROLINE, XYLITYLGLUCOSIDE, ANHYDROXYLITOL, XYLITOL, GLYCERYL STEARATE, PHENOXYETHANOL, ETHYLHEXYLGLYCERIN, SODIUMPOLYACRYLATE, HYDROGENATED POLYDECENE, TRIDECETH-6, BUTYROSPERMUM PARKII BUTTER, TOCOPHERYL ACETATE, SODIUM HYALURONATE, RETINYL PALMITATE, HELIANTHUS ANNUUS (SUNFLOWER) SEED OIL, BHT, PARFUM, TETRASODIUM EDTA, SODIUM HYDROXIDE, BHA.